Given that Josef Jakobs and Karel Richter trained together in Hamburg under the Abwehr, I am always interested in information on Richter. Sifting through the internet the other day, I came across a rather odd article and even odder site that mentioned Richter. The site is called the Online Publishing Company (OPC) and is run by Giovanni Di Stefano, a convicted fraudster according to Wikipedia. Soooo... let's just say that the site and its authors seem a bit dubious. The article "Two Historic Convictions, Executions and An Urgent Appeal To Our Readers" is written by "Giovanni Di Stefano & Caroline Bayford" and dated 2014-06-26. The first "historic conviction" is that of Anthony Mancini. The second is that of Karel Richter. 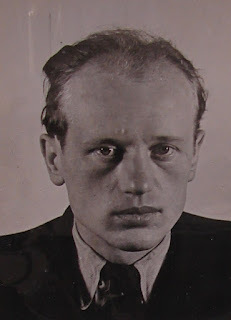 The article includes a photograph of Karel Richter - the one from the National Archives but there was no acknowledgement of the photo's source. According to the OPC article, Richter's mission was to assassinate the exiled Czechoslovakian premier and also to pass on money and information to other enemy agents already in the country. It is highly doubtful that Richter was sent over as an assassin, but I suppose everyone is entitled to their own speculative fantasy. The rest of the article touches briefly on Richter's capture and trial, but focuses most of its attention on his execution. The authors make much of the fact that trial was held in camera, something that was quite "unusual" according to them. The account of the execution is likely that of Albert Pierrepoint (the executioner) but again, there is no acknowledgement of sources. The story of Richter's struggle follows Pierrepoint's account fairly well until the moment just before the trap door opened. At that moment, as the rope slackened, the drop fell. As he did Richter shouted ‘the trial.’ [N.B. Well, that's news to me.] The rope swung violently in the pit but Richter was hanging limp and lifeless his neck was broken and dead. It had taken 17 minutes from entering the cell to the condemned spy hanging beneath the trapdoors. Do you have access to the trial transcripts now 71 years old? [N.B. Yes, they are at the National Archives.] Are you a relative of Karel Richter? Are you a relative of PC Scott? Do you have any information regarding the case? Were any of your relatives the interrogation of Richter? Are you related to Mr Justice Tucker? Do you have anything that may shed light on what Richter was trying to say? If so please contact our editor Caroline Bayford. Conspiracy theories are all well and good, but I find it annoying when people have not done their research, nor named their sources. The Security Service files, the Central Criminal Court files and Prison Office files have all been released to the National Archives. Albert Pierrepoint's account of Richter's execution makes no mention of the words "the trial" but, I suppose conspiracy theorists would argue that MI5 had those words edited out. As they say "don't confuse me with the facts, my mind's made up". I wish OPC and Caroline Bayford the best of luck in tracking down the "truth" behind Richter's trial and execution.